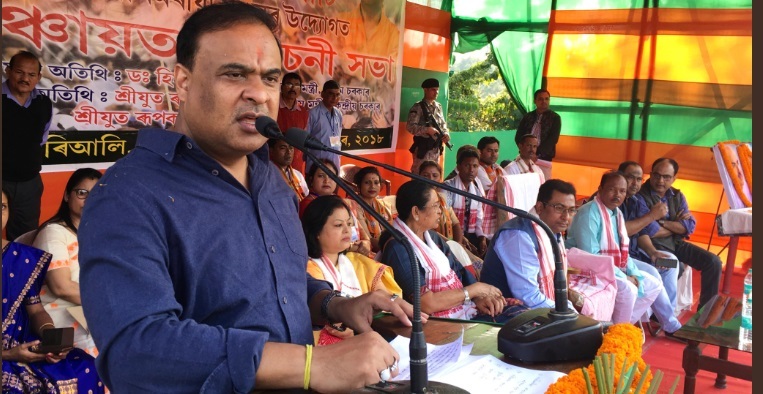 Finance Minister Himanta Biswa Sarma addressing an election rally in Nagaon on Monday. Continuing his attack on AGP, an ally of the BJP government in Assam, Assam Finance Minister Himanta Biswa Sarma dubbed senior party leader and two-time chief minister Prafulla Kumar Mahanta, as ‘ungrateful’. Addressing an election rally at Barhampur, Mahanta’s home constituency, Minister Sarma said that the former Chief Minister totally failed to deliver. “I think it’s because of the patience of the people of Barhampur constituency that Mahanta has been elected six times to the Assam Assembly. Had he contested from our areas, he couldn’t even have won a panchayat election,” Sarma said. He said BJP workers had worked hard to ensure Mahanta’s victory in the last assembly elections but he didn’t express a single word of gratitude to them. “Right from the day he won, he has been criticizing our government even though his party, the AGP, is our alliance partner,” he added. Continuing his tirade against AGP leaders, Sarma said had the BJP not supported them, president Atul Bora and working president Keshab Mahanta couldn’t have emerged victorious in the elections and become ministers. He further slammed the Congress and the AIUDF, terming them messiahs of illegal Bangladeshi migrants.